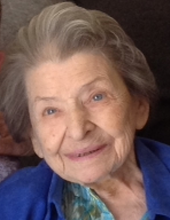 Charlotte “Char” Bernstein, age 100 years, died peacefully on Wednesday, January 30, 2019, surrounded by family at her home in Iowa City. There will be a small gathering on Sunday, February 3 at 11:30 at Lensing Funeral and Cremation Service, 605 Kirkwood Ave, Iowa City. In lieu of flowers and plants, the family requests that memorials be directed to Iowa City Hospice or a charity or organization of choice. Lensing Funeral & Cremation Service is handling arrangements. Born October 22, 1918 in Chicago, the daughter of Aaron and Esther (Superfine) Mark, Char grew up in Chicago and graduated from Roosevelt High School in 1936. She married Harry Dreyfuss on January 14, 1947, in Chicago. Together they had one child, Judith (Judy) Eve, in 1949, while stationed in San Antonio, Texas. They traveled extensively while Harry served in the US Air Force with postings that moved them to the Carolinas and Alaska. After Harry’s passing in 1961, Char and Judith relocated to be near relatives in Skokie, IL where she met Joseph “Joe” Bernstein at her synagogue. They would be married in 1966, and their blended family would now include siblings Meryl, Harlan, David and Randy. Joe and Char lived in Skokie until their retirement to southern Florida where they enjoyed 25 years together in their community of Palm Aire. They made many friends and hosted frequent visits with their children and grandchildren. They were avid travelers and especially enjoyed cruises to warm destinations which included the Mediterranean, Europe, the Caribbean, Panama Canal, and elsewhere. In their later years they relocated to Iowa City, where Joe passed away in 2006. Meryl Levitz of Cherry Hill, New Jersey, Harlan Bernstein (Roberta) of Glenview, Illinois, David Bernstein of Florence, Oregon, and Randy Bernstein (Amy Steckel) of Eugene, Oregon, a sister, Marcia Z. Mark of Chicago, grandchildren Michael Levitz (Midori), Ben Galluzzo (Jill), Ian Levitz (Nicole), Adam Galluzzo (Teresa), Claire Kap (Joost), Sarah Bernstein, Melissa Bernstein, Julia Bernstein and Daniel Bernstein, and great-grandchildren Max, Mae, Joanna, Gray, Jonah, Lucia, Soren, Sylvie, Emilia and Loren and many nieces and nephews. All who knew her will deeply miss her feisty and loving spirit. She was truly one-of-a-kind. Char was preceded in death by her parents, her husband Joe, two sisters, Leona Klesman and Hannah Slater and a son-in-law, Len Levitz. To send flowers or a remembrance gift to the family of Charlotte "Char" Bernstein, please visit our Tribute Store. "Email Address" would like to share the life celebration of Charlotte "Char" Bernstein. Click on the "link" to go to share a favorite memory or leave a condolence message for the family.